Did your child(ren) attend classes or lessons at the Institute during 2018-2019 in the school year? How many child(ren) will you be registering for Summer Arts Institute? Child Small (4-6) Child Medium (Size 8-10) Youth Large (Size 12-14) Adult Small Adult Medium Adult Large Adult XL Adult XXL Two shirts are included in the price of your registration, if you would like additional tee shirts please enter how many additional you would like below. 3rd-11th Grade Half Day - 8:00 - 12:50 PM Half Day and Recreation Sessions Program = Student will not be part of the final showcase. 3rd-11th Grade Full Day with Recreation Sessions - 8:00 - 3:00 PM 3rd-11th Grade Full Day with Recreation Sessions and Aftercare - 8:00 - 5:00 PM Half Day and Recreation Sessions Program = Student will not be part of the final showcase. 3rd-11th Grade Full Day with Production Classes - 8:00 - 3:00 PM 3rd-11th Grade Full Day with Production Classes and Aftercare - 8:00 - 5:00 PM Half Day and Recreation Sessions Program = Student will not be part of the final showcase. 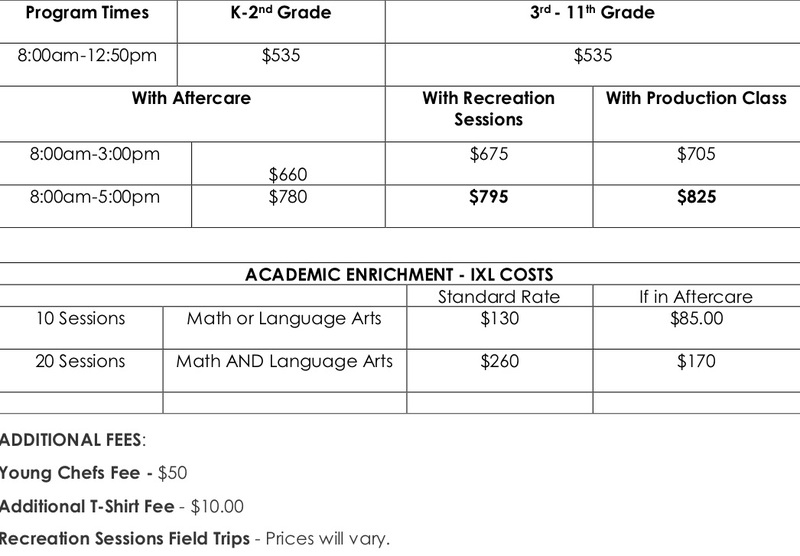 No Yes, 10 Sessions of Math or L Arts Yes, 20 Sessions of Math or Language Arts Additional fees apply. No Yes, 10 Sessions of Language Arts or Math in Aftercare Yes, 20 Sessions of Math or L.Arts if enrolled in Aftercare Additional fees apply. Will you be entering a second Parent/Guardian Name? This confirms student(s) registered has my permission to participate in classes at The Institute of Music and I will be responsible for tuition fees and will make sure attends regularly and has transportation. Students class schedules are based on a Day One & Day Two schedule. Students participate in four (4)arts classes throughout day one and a different combination of four(4) classes in day two. Students may pick their top four (4) class choices. The Institute cannot guarantee that students will be placed in all of their chosen classes, but will try to place students in their top 2 choices. ALL class selections are final. Please select... Singing The Voice (vocal & performance skills for solos and duets) Capoeira (Afro-Brazilian Martial Art) Dance (mixed styles) Breakdance Stepdance (rhythm & sequence based clapping, stepping choreography) Hip Hop Dance Anime/Cartooning Fashion Design Filmmaking (5th – 11th grade only 2 hr. class) Electronic Music Production - (5th – 11th grade only) Recording Artist (Practice and record vocals) DJ Veggie Orchestra Public Speaking Creative Writing Songwriting Young chef Yoga Meditation & mindfulness Kidsteem (building self-esteem & confidence) Taiko (Japanese Percussion) Samba Drumming (Brazilian) Music Exploration Composing (creating original instrumental music) Violin Guitar Piano Rock Band (Must have a minimum of 3 years with instrument, be able to read music, be able to provide own instrument) If you have selected an instrument for any of the choices, please indicate playing level below. Students will only get 1 selection. Trips are subject to change. Other trips may be added during summer. 1. SWIMMING recreation session would be held at The Boys & Girl Club in Union (Must bring swimsuit & towel. Students will be notified when they are scheduled for swimming) 01 Hour /$7.00 ea. How many times would you like to go? 2. BOWLING recreation will be held at Newark Museum 01 Hour /$6.00 ea. 4. TURTLE BACK ZOO recreation will be held at Day /$10.00 . I hereby give permission for my child to travel by van with The Institute of Music for Children on designated trips as part of summer camp. Permission to travel is given from July 2 through August 3, 2018. In granting permission, I hereby expressly waive my claim for liability against The Institute of Music for Children, Inc. including its employees and representatives and release them from liability in connection with this trip. Further, I assume full responsibility for any damage to persons and/or property caused by the student. Total Number of people in the Household? For additional student please select "Add another response"
Payments with CASH or CHECK must be received within seven days after your registration has been confirmed. Tuition payments can be paid in full or can be split into 3 installments (Costs vary depending on programs). A minimum of 1/3 of the total cost is within the 1st week of your registration. 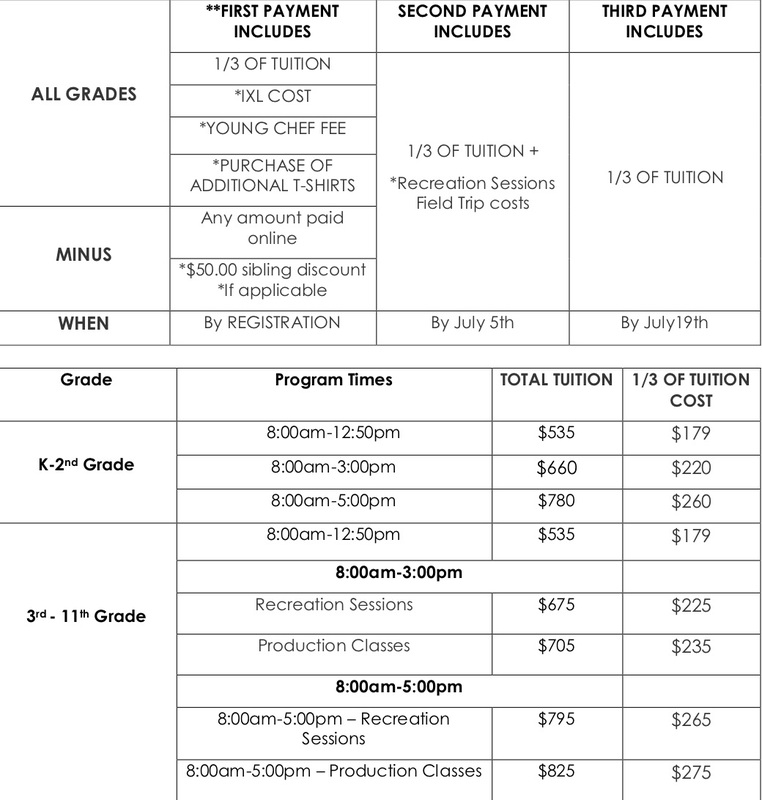 Payments may be made in a series of 3 installments throughout the Summer Institute. o Payment 2 is due by July 5th. If not paying in full, we require a payment security with a valid credit or debit card. If we do not receive payment within 7 days of the payment due date your card will be charged the installment due plus a $25 late fee. I WOULD LIKE TO SIGN FOR AUTOMATIC PAYMENTS? WOULD YOU LIKE TO SIGN IN FOR AUTOMATIC PAYMENTS? PLEASE BE SURE TO SUBMIT ONLY ONCE SO YOUR CC WILL BE CHARGED ONE TIME.